Like any group of guitar nerds, the Wildwood staff spends approximately 98 percent of its time brainstorming cool band names. One thing is for sure: we're mad that we never came up with anything as good as The Sword. Reverend endorsee Kyle Shutt and his bandmates did, though, and it's a fitting descriptor for the sound of their band. The Austin-based foursome blends groovy bluesy sludge with breakneck metallic thrash and far-out seventies psychedelia to create modern metal that would sound just as appropriate blaring out the windows of a Camaro as it would in the cockpit of a spaceship preparing to enter the fray of an intergalactic battle. At the heart of it all lies Kyle Shutt's driving riffs and bombastic solos. He's a master of the metal idiom, but his eclectic blend of influences has helped him break free from stylistic constraints to develop a voice unlike any other in the genre; after all, how many metal guitarists do you know who list Prince's Sign 'O the Times AND Elvis Costello's My Aim is True among their top five records? Kyle does! It was only natural that such an innovative player would attract the interest of Reverend Guitars. The Reverend team quickly found that Kyle was a kindred spirit, and they set out to design a guitar that would be able to handle the wide dynamic range of The Sword's music while remaining totally heavy, man. 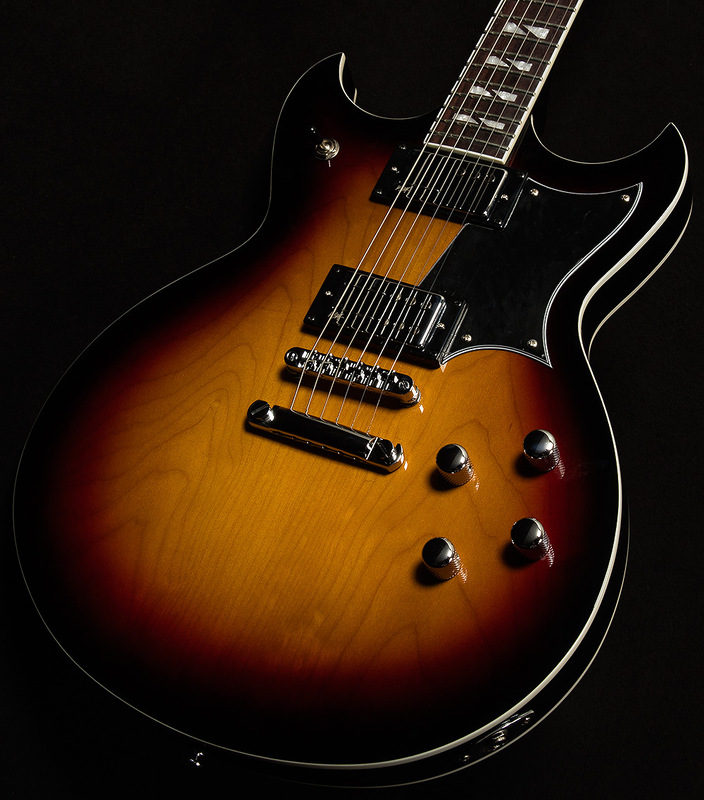 Using the semi-hollow Manta Ray as a basic platform, they designed a guitar that solves a problem that has plagued hard-rocking guitarists since the Dawn of Iommi: namely, that we never use anything but the bridge pickup. Not that there's anything wrong with the bridge pickup--after all, who doesn't love the sound of a bridge humbucker slathered in distortion--but accessing the full dynamic range of the instrument is nice, too! Wouldn't it be cool if you could (gasp!) switch to the neck pickup without losing clarity or volume? Joe Naylor and the team at Reverend solved this problem and gave the Kyle Shutt Signature an extremely expressive array of usable sounds by incorporating a variety of innovative design techniques. First off, making these guitars semi-hollow was an inspired decision. Having a little bit of air in the sealed korina bodies gives these guitars a bright, clear, lively high end that allows you to maintain excellent note separation and balance even when you pile on mountains of gain. Even though I just wrote at length about the versatility of these guitars, it is awfully difficult to break free of the Kyle Shutt Signature Railhammer in the bridge position, because its tone is downright addictive. Its midrange frequencies somehow manage to be broad and cutting at the same time, like an enormous claymoor broadsword that you have to swing with both hands. On the other hand, the lows are full of bombastic cannon-like boom, and the highs rip and sear with the best of them. That sound would be cool by itself, but when you roll off the bass contour knob, it sounds like an entirely different pickup! The lows lose their Sabbathian qualities and become tight enough for Iron Maiden-esque gallops and Metallica-style chugging. The mids become quite toothy, too--envision a machete with fangs and you'll get the gist of how they sound. When you are finally able to unglue yourself from the bridge position, you will find a wealth of sounds awaiting you in the neck pickup. It's a P-90-style Railhammer, and the Reverend team wound it to match the bridge pickup's output so you can get consistent response from your amp. With all the knobs on full blast, it sounds so rich that you feel like you're playing four notes when you're fretting just one. The bass response is thick and deep, but the percussiveness and open top-end imparted by this signature model's semi-hollow construction ensure that you will always maintain clear, articulate tone. Rolling off the bass contour knob makes the highs snarl a bit more while giving the low frequencies a rounder, more vintage-inspired sound. These two complementary voicings ensure that you'll never be lost for options while wielding the Kyle Shutt Signature! We are proud to offer such an inspiring guitar to our exceptional customers, and we cannot wait to see how you use it to slice and dice your way into musical Valhalla! Kyle Shutt Signature Railhammer Pickups, Bridge - Designed to sound similar to a vintage PAF humbucker, but with more power and a fatter, rounder tone. Neck - P90 style tone, but with no hum. Designed to match up tonally and volume-wise with the bridge.